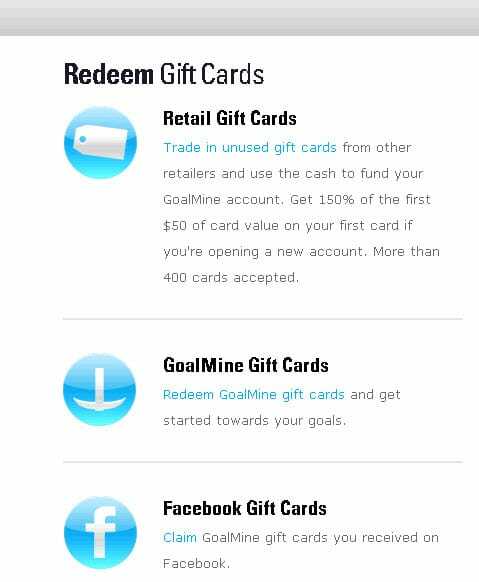 Goalmine Review – Any Good for Beginner Investors? 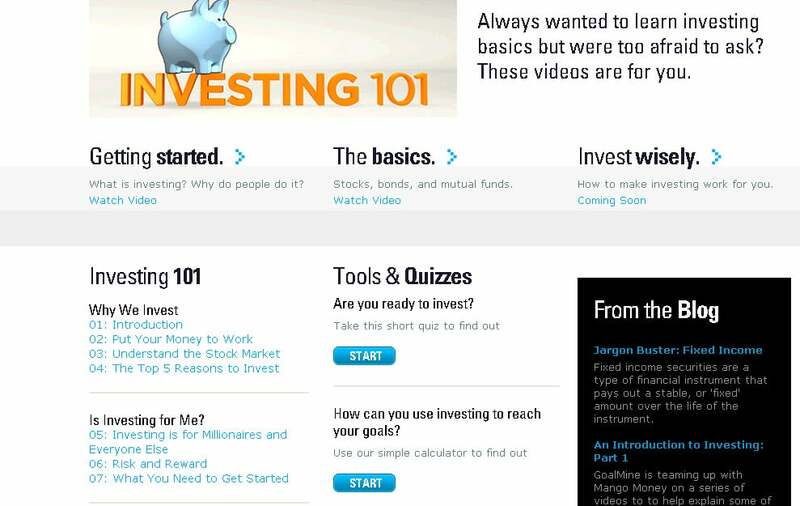 If you are a beginner investor it’s really hard to know where to start. I know that because I get emails every week asking just that question. There are many sites that profess to help people just starting out in the investing game and one such site is Goalmine. I’ve done an intensive review of the site from the standpoint of a beginner investor and found some really neat features as well as a few flaws. Here’s my Goalmine review. 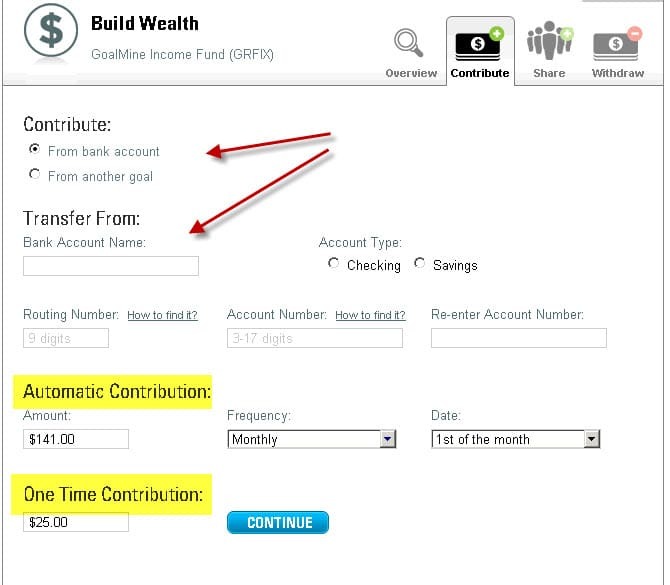 Goalmine is a site that was built for people just starting their financial lives. It helps you identify your goals and attach a monetary target to achieve those goals. It tells you how to invest and it automates your investing. You can start with as little as $25 and there are no transaction fees for buying or selling. So far so good. Getting started with Goalmine is super easy – it took me 5 minutes to open an account and set up my goals. Let’s go through setting up a goal. 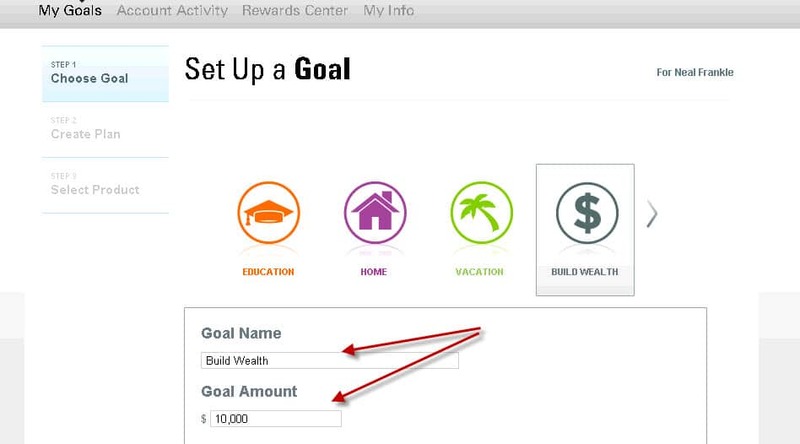 As you can see, the “Goal” page allows you to name your goal and the amount you need to reach that goal. If you don’t know what it will cost you to achieve your goal, you could use any number of financial calculators on the web. Once I set up the goal, Goalmine tells me exactly how to achieve it. 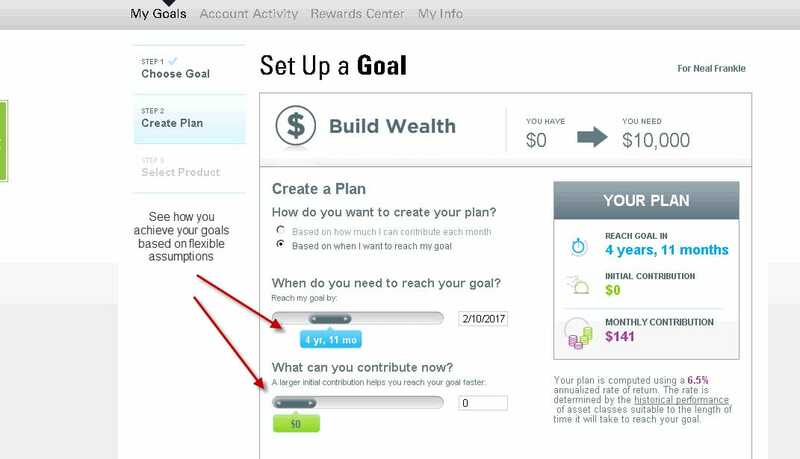 First tell the site if you want a plan based on when you want to reach the goal or based on how much you can afford to put away. I like that flexibility. Then you can change your assumptions until you find a plan you feel comfortable with. For our example, I chose a plan based on when I wanted to reach my goal. I wanted to save $10,000 in 5 years or less. I told the site that I didn’t have any money to contribute now and that I would rely on steady monthly contributions. Based on that input, the site told me to save $141 per month. If I can’t save $141 every month I c change any of my assumptions such as increasing my time frame. I can continue doing this until I find a monthly amount I can live with. The next screen takes me to my investment choices. 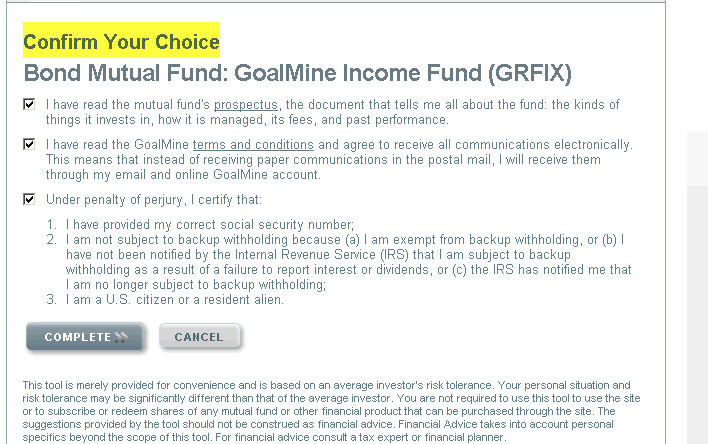 Based on my 5 year plan, Goalmine automatically selects the bond fund for investments. I could always over-ride that selection if I wanted to but this is a nice feature for people who really don’t know how to match their investments to their time horizon. This site does it for you. What I don’t like about this page is that the returns aren’t fairly compared. I’m sure that the 5 year track record of the stock fund is accurate just as the 2 year record for the bond fund is accurate and just as the 1 year track record for the FDIC saving account is accurate. What I don’t like is that they compare a 1 year CD track record to a 5 year mutual fund track record. That creates inappropriate expectations and may lead to improper investment decisions. Let’s continue. Then, the site helps you set up automatic and/or one time contributions. To be fair, this site has taken all the work out of automating your investments and you have to give them credit for that. They also make it very easy to withdraw money from you account whenever you like. What I mostly like about this site is how easy they make it to automate your investing. What separates successful investors from unsuccessful investors is that successful investors have a systematic investment plan. As you’ll see in a moment, I’m not nuts about the investment options in Goalmine, but given the choice between keeping it really simple and getting it done vs. making it difficult and not getting it done, I’ll take the simple system any day. I do like the vast array of educational videos they have to help you learn as you go. I was really impressed by the extensive catalog of videos. I also like the gift card program. This allows you to take old unused gift cards and turn them in for dollars you can invest. That’s pretty cool if you ask me. In fact, they have a program that gives you 150% of the first $50 of card value on your first card for new accounts. That’s a pretty good return on your money right there. I already told you that I don’t like the comparison between the 1 year bank performance and the 5 year stock fund performance. You will experience much greater volatility over 1 year than 5 and you must be prepared for that. This site doesn’t really help you have realistic expectations in that regard. Also, while I understand the need to keep things simple, they may have gone too far. The site has you invest 100% in FDIC bank deposits if your goal is very short term. I am OK with that. But they have you invest all the money in a bond fund if your goal is mid-term and they suggest you invest all your money in one equity fund if you have a long term goal. So they basically offer 3 different choices and that’s it. They don’t structure the investments based on what is happening in the market real-time. I guess that might be too much to ask for but I do see this as a major flaw. The performance of the funds hasn’t been great and even it was, that’s no guarantee of future results. I like more investment choices than these folks offer. Sorry. I was a beginner with very limited money and/or time. I had a 5 year goal or more and felt comfortable with equity funds. Bottom Line – Wealth Pilgrim is NOT a fan. Lucky for you and unfortunately for Goalmine, a better system is available. I did a review of Betterment a few weeks ago and I just think it’s a much better way to go. I say that because the funds are lower cost. Betterment uses highly liquid ETFs through Vanguard. Also, the portfolios offer much better diversification and you can actually shift the allocation at will. Goalmine doesn’t allow that. 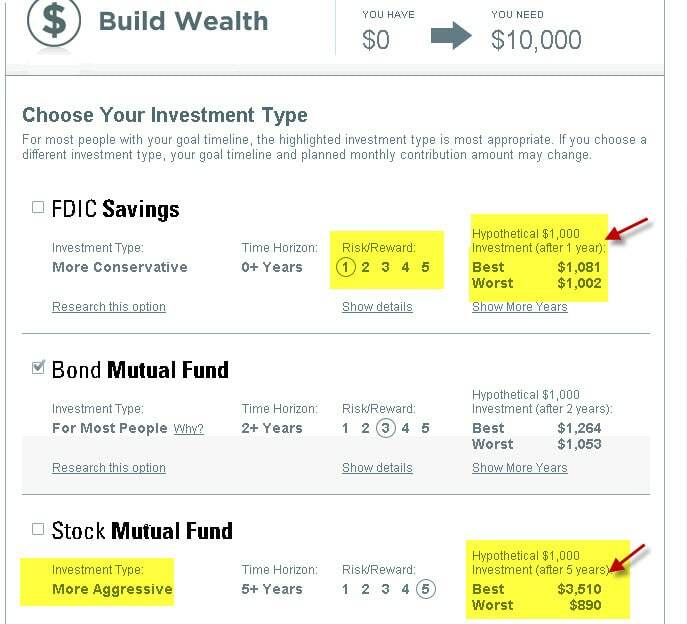 Betterment gives you 4 or 5 choices just within the equity portion of your portfolio. Goalmine gives you one fund and that’s it. Ehhhhhh. That makes me nauseous a little. Sure Betterment charges you .15 to .35% but that’s probably much less than what the funds that Goalmine uses, Also, I just don’t like doing business with a financial advisor who sells their own funds and that is what Goalmine is doing. You could easily duplicate the calculators these sites offer and you could also automate your investing with just about any mutual fund company. At the end of the day, you would likely still be left with one fund so it may not pay to re-invent the wheel. And while you could replicate this system, you probably wouldn’t because it would be a lot of work. That’s why Betterment is a much better way to go. I can’t stand spending 3 hours writing up a review and then finding out the offer isn’t so hot but those are my honest feelings. If you are just starting out, it might pay to give Goalmine a try. You can use their videos to learn a great deal and once you build your account up to something substantial, you can always transfer the assets out and utilize better investment strategies.